The text tells the Christmas story in a simple cumulative poem with the rhymthm of a well-loved nursery rhyme, which has instant appeal to children. Everyone who sees them is captivated by the amazing, powerful illustrations. Sensationally acclaimed by the critics on first publication; this is a Christmas classic, ideal for introducing the youngest children to the Nativity story or for re-awakening its magic for older readers. 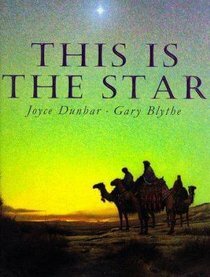 About "This is the Star"
JOYCE DUNBAR has written more than fifty books for children, including The Very Small and This Is the Star. She lives in Norwich, England.